Oracle Application Express (Oracle APEX) is a fully-supported, comprehensive web applications development suite for Oracle database. It is a low-code solution that handles much of the web development process including authentication, security, database interactions, session state management, input validation, and other interactions. The software empowers users to develop, design, and deploy highly-responsive, data-driven web applications with the help of only their web browser. It allows web developers to easily focus on the task at hand thanks to its built-in suite of sample and productivity applications. 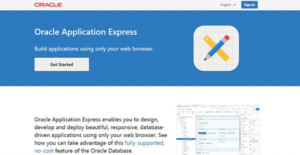 Oracle Application Express delivers all the tools required to scale the heights of web development in a cohesive but extensible platform which operates within the Oracle database. Some of its key features include interactive grids, Oracle JET charts, code editor, drag and drop layouting, browser-based IDE, icon library, and customizable user interface. Oracle Application Express provides all the tools and development features developers need to be more productive. It makes web development simple, fast and powerful with features such as sophisticated code editor, browser-based IDE, and intuitive drag & drop layout. Whether you are a newbie or a seasoned enterprise developer, Oracle APEX will eliminate the complexity involved with the multi-faceted web applications development. It demands limited programming experience to create and deploy secure applications for any devices (desktop and mobile). Oracle Application Express supports low-code app development to enhance productivity. It leverages powerful components with greater consistency, higher fidelity, and more feature function. This enables developers to single-mindedly develop and deploy superior solutions all with minimal effort and time. It allows citizen developers to automate business processes and dramatically improves the maintainability and productivity of application development. If you are interested in Oracle Application Express it could also be a good idea to analyze other subcategories of Best IDE Software collected in our base of B2B software reviews. It's essential to realize that almost no software in the IDE Software category is going to be a perfect solution that can meet all the requirements of all business types, sizes and industries. It may be a good idea to read a few Oracle Application Express reviews first as some software may perform well exclusively in a really narrow set of applications or be designed with a really specific type of industry in mind. Others may function with an idea of being easy and intuitive and therefore lack advanced functions desired by more experienced users. You can also find software that support a large group of users and offer a powerful feature base, however that usually comes at a more expensive cost of such a solution. Ensure you're aware of your needs so that you get a software that provides all the functionalities you look for. How Much Does Oracle Application Express Cost? We realize that when you make a decision to buy IDE Software it’s important not only to see how experts evaluate it in their reviews, but also to find out if the real people and companies that buy it are actually satisfied with the product. That’s why we’ve created our behavior-based Customer Satisfaction Algorithm™ that gathers customer reviews, comments and Oracle Application Express reviews across a wide range of social media sites. The data is then presented in an easy to digest form showing how many people had positive and negative experience with Oracle Application Express. With that information at hand you should be equipped to make an informed buying decision that you won’t regret. What are Oracle Application Express pricing details? What integrations are available for Oracle Application Express?